Iran’s currency rally, offsetting some of a 75% drop this year, has ended after 48 hours. The Iranian rial suddenly gained more than 25% on Monday and Tuesday, wiping out its latest sharp drop against the US dollar. At one point, it stood at 135,000:1 — compared to 190,000:1 last week. But this morning it has fallen back to 150,000:1. The cause of the fluctuation is unclear. Some analysts have pointed to last week’s announcement between the European Union and Tehran of a “special payments channel” so trade can bypass comprehensive sanctions. Others have cited the effect of three death sentences handed down for “economic crimes”, leading some speculators to sell off their dollars. And still others suggested that dealers are aggressively buying up dollars from individuals at discounted rates, anticipating the further devaluation of the Iranian currency with comprehensive US sanctions next month. It does not make any sense at all that from 4 o’clock in the afternoon until the day after suddenly the price of the dollar plummets by 30 to 40%. It is not natural. It can be either the trick of the government or dealers who seek to collect the people’s dollar savings. There is no management in this. 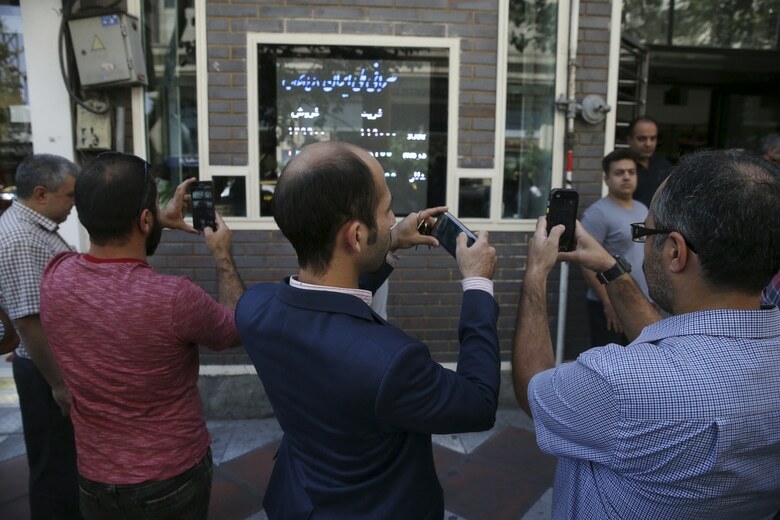 The Rouhani Government, which has tried to restructure the foreign exchange market, announced on Tuesday that it will offer five-year residency permits to foreigners if they invest $250,000 in the country. Deputy Petroleum Minister Amir-Hossein Zamaninia held out hope with the declaration that Iran’s negotiations with the EU to reach an agreement to sell oil to Europe are advancing, despite the US sanctions which will be levied on Tehran’s energy sector from November 5. The European Union has said it will shield European companies from US punishment over continued business with Iran. However, the EU has been unable to extend guarantees against American fines that could be billions of dollars, leading large firms — including French energy giant Total — to suspend or draw down links with the Islamic Republic.